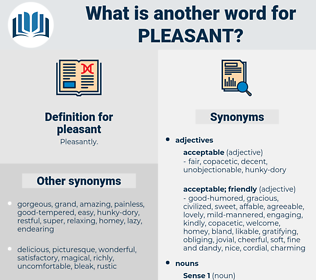 What is another word for pleasant? just for heck of it. beautiful, entertaining, splendid, refreshing, pretty, elegant, fun, gentle, pleased, loveable, gracious, convenient, comforting, amiable, interesting, user-friendly, rewarding, likeable, satisfying, decent, grateful, lovable, welcome, courteous, positive, fortunate, likable, endearing, polite, cool, magnificent, satisfactory, easy, nasty, felicitous, mild, joyous, cosy, upbeat. Rode, drove, Threw, pulled, Did. agreeable, lovely, congenial, comfortable, gratifying, wonderful, palatable, attractive, sympathetic, friendly, cheerful, excellent, appealing, joyful, charming, engaging, handsome. hateful, troubling, disagreeable, gloomy, unenjoyable, rude, ugly, boring, nasty, repulsive, bitter, unhappy, discordant, unpleasant, agitated, harsh, ungracious, offensive, unlikeable, unacceptable, incompatible, unfriendly, worrisome, sad, bad, severe, bothersome, mean. surly, disdainful, complaining, miserable, impolite, reserved, grouchy, grumbling. dark, dusky, black, murky, dreary, cloudy. gruff, peevish, petulant, commonplace, unkind, uncivil, detestable, quick-tempered, irritating, tragic, lachrymose, arrogant, grumpy, dogged, regrettable, crabbed, lugubrious, peeving, infuriating, tedious, Dissatisfying, ungenial, aggravating, querulous, exasperating, stale, Pleasureless, fussy, Unamiable, disheartening, yucky, perturbing, Outraging, wretched, distressing, maddening, deplorable, insipid, vile, cruel, flat, irascible, vexing, glum, inconsiderate, inflaming, crusty, unmannerly, discourteous, repelling, vinegary, austere, Revulsive, sullen, dolorous, touchy, unsociable, ill-mannered, unlovely, boorish, doleful, sorrowful, acrimonious, incensing, lamentable, joyless, cranky, upsetting, morose. Was not this other lady a pleasant person?" But it won't be very pleasant for you in Mayberry.